Think about it this way: why do people procure renewable electricity or buy organic food? To support the transformation of our social and economic systems through purchasing power. To not contribute to the cause of harm and destruction of our ecosystems or our societies. If you work for a socially-conscious business, this is probably the reason you sought out this line of work in the first place. As a consequence, you probably want your advertisement funds to support an organization that does not pay out any surplus for private benefits, but instead uses it to restore our planet's ecosystems. We also pay our fair share of tax and respect our users' privacy. And you are likely to find that advertising on Ecosia is a bargain: while it does not have the same reach as Google, we are considerably cheaper. And in some cases, Ecosia will provide you with better quality traffic. We don't collect store data on our 8 million search engine users, and therefore do not have profiles of them. What we do have is aggregated information about our 1 million Facebook followers. As you can see, most of our users are young: one third of them are aged 18-24 or 25-34 respectively. We have more female followers than male. And we think it's safe to assume that all of them care for green topics and make conscious purchasing decisions. How can I advertise on Ecosia? Like other search engines, Ecosia is partnered up with one of the two oligopoly search providers in the West, Microsoft (the other obviously being Google, with with 80% market share). We are very transparent about our partnership with Microsoft. They provide our search results, and all of our advertisement is managed through the Bing portal. Therefore, if you want to advertise on Ecosia, then you need to advertise on Bing. Bu with a little trick, you can exclude some or all other partners from Bing’s partner network. This article explains how. If you do not have an advertisement account with Bing, you can open one here. Once you launch a campaign, you can focus it like described above. In case of problems, please reach out to us at advertisement@ecosia.org. 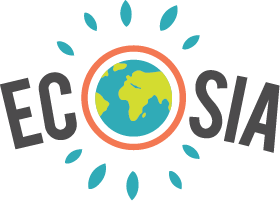 If you have an agency to run your advertisement campaigns, make sure that they include Ecosia. We are told that some of them think it is “more convenient” to just advertise on Google, because of the huge reach. But, their convenience is costing you money and your brand’s integrity. In case you are looking for a green media agency, we are also happy to help.